Product code: T885 Categories: Sold Items, Sold Jewellery. 15ct gold is very hard to come by, as is a full length genuine antique Albert chain, so it is a pleasure to offer this 15ct rose gold antique Albert chain from the 1890’s that is still in superb condition and can so easily be worn on a daily basis even though well over 120 years has passed since it was made. 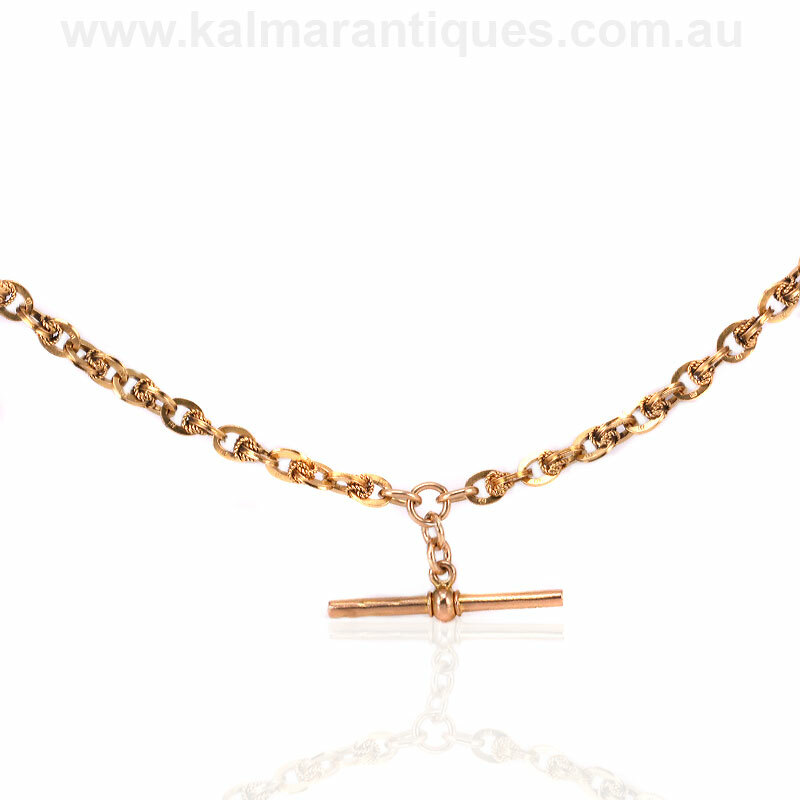 Albert chains or fob watch chains as they are also know as, were originally designed for a gentleman to hold a pocket watch at one end and the key or a fob at the other end, with the tee bar connected to the waistcoat. Years later when men stopped using pocket watches and started to wear wrist watches, women years later started to wear these around their neck where they are often seen today. 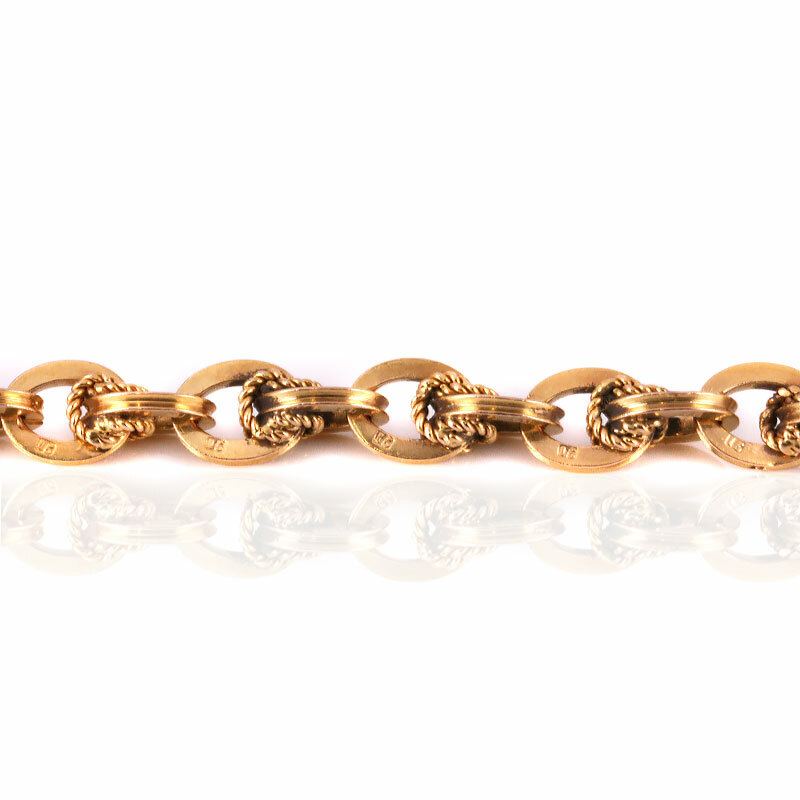 Quite often Albert chains are seen as half Alberts that only have one half of the chain, or they are double but simply too short to wear around the neck, but this one measures 40cm in length and is all original with no additional pieces added to it. The link itself is absolutely gorgeous and with each link stamped 15ct is a real treasure to find. Fitted with its two original swivels and tee bar, this is such an attractive, rare and beautiful genuine antique Albert chain that will always be admired.